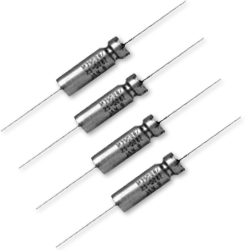 March 10, 2017 -New Yorker Electronics is now distributing the Vishay tantalum-cased, hermetically sealed wet tantalum capacitor with the new, expanded capacitance ranges. The new device features a wide voltage range from 50V to 100V, high capacitance from 220µF to 680µF, capacitance tolerance of ±10% and ±20% standard and a maximum ripple current of 2750mA. Offered in the axial T1, T2, T3 and T4 case size, the M39006/33 operates over a temperature range of -55°C to +85°C, to +125°C with voltage derating. It is the industry's first such device to be qualified to the MIL-PRF-39006/33 specification. MIL-PRF-39006 establishes 1000h failure rate levels of 1%, 0.1%, and 0.01%. For designers, the M39006/33 (Style CLR93) offers established reliability for critical avionics and aerospace systems. The device combines its high capacitance and high reliability with excellent reverse voltage, vibration and thermal shock performance. Optimized for timing, filtering, energy hold-up and pulse power applications in power supplies for space and avionics equipment, the M39006/33 allows designers to incorporate fewer capacitors into these products to lower overall system costs. New Yorker Electronics is a franchise distributor for Vishay Semiconductors and carries the full line of Vishay Super 12 Featured Products as well as its full line of discrete semiconductors (diodes, MOSFETs and infrared optoelectronics) and passive electronic components (resistors, inductors and capacitors).